Chris Froome (Team Sky) backs new International Cycling Union (UCI) president Brian Cookson to rid cycling of its old dope-tarnished image, according to Sky Sports. The Tour de France champion was speaking to the media in Japan, on the eve of the “Saitama Criterium by Le Tour de France,” in Saitama, on the outskirts of the Japanese capital, Tokyo. Froome knows Cookson well from his many years as president of British Cycling, and feels that the new broom that his compatriot represents is what the sport needs to clean up its image. "It really is important for us and hopefully that's something a new president in the UCI can help us to achieve, which is move past that old image and the baggage from the past and show people that the sport really has turned around since those darkest days," said Froome. "It is frustrating, but I have got perspective on it and can see it from the fans' point of view and the media's point of view. I too used to follow those races and support those riders, so I can understand where the anger and frustrations are coming from, and it is up to us now to show that we have moved on." 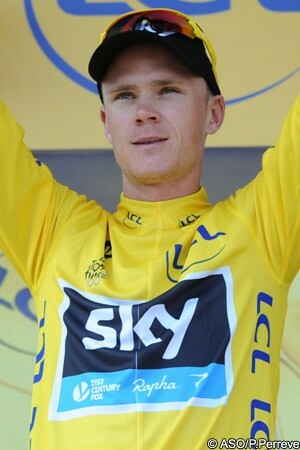 Froome was also questioned on his rivalry with Sky Procycling teammate Bradley Wiggins, for whom he was in service during the Belgian-born Londoner’s own tour win in 2012. The team has hinted that the two riders may be reunited at the 2014 Tour, with its British start, and that it would not be a problem; this is something that Froome himself concurs with. "[The rivalry] is something the media keep trying to build up to create more of a story, but it is non-existent," he said. "The team leader is always changing, the team has to go with who is currently the best, so I can't say I'm the team leader. "If I'm not going well in January, they will support someone else. Maybe Richie Porte will be the team leader, so you can't say this guy is team leader. It is not how cycling works." With Tokyo having recently been named as the host of the 2020 Summer Olympics, Froome - as a bronze medallist from London 2012 - was naturally asked if he would be hoping to win another medal in seven years’ time. "That is a long way in advance, but seven years, I'm currently 28, so there's no reason why I shouldn't be competing at a good level at the age of 35," he answered. "For me a race like the Olympics would always be a bit more of a gamble. It is a one off event, a one-off hit out. “I don't know if I will ever be able to medal again at an Olympic Games, but certainly I would like to give it a try."